Secret Doors: Young at Heart. Anyone ever wish they could be little again? I remember just being so carefree and oblivious. I could have fun with just about anything and my imagination ran wild! Back then my mind was still fresh and though the pressure be thin was still there, it didn't hit me as hard. Thinking of this young, free-spirited girl inspires me. I know that deep inside she is with me and sometimes you can catch little glimpses of that little girl every time I smile, laugh, make a goofy remark or just stop worrying. Well after days of going through all my crap and clutter in my room, I came across lots of pictures and stuff I would play with back in the day. It makes me think about how much I've changed over time and how much I've let ideas and pictures society puts out there change me. As I work on myself and begin to open all the secret doors inside of me, I want to also bring back that little girl more and more. And, though this is way off in the future, I want to make sure my kids make sure to keep a part of their younger selves with them, not let who they really are get away, and definitely not conform to what society says they have to be. Alright -- I'll get back atchya later with less serious stuff..but I gotta start getting ready. Me and two of my girls are going out to lunch, I'm so happy because its been long over due! I found that when I first began recovery, I went through a type of regression (I'm a Psych major, so I analyze everything). Despite the fact that I was 19, I wanted dolls, and toys - things that would comfort me as I worked on myself. I suppose it was the same things that had comforted me as a child. 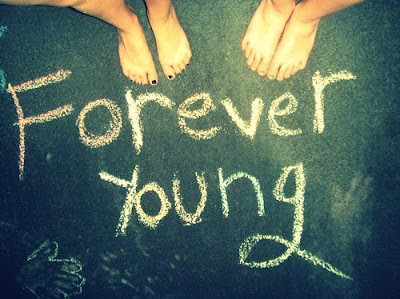 I love that picture Forever Young. It's so true. I too would want my children to always keep a part of childhood with them as they age. To always have the ability to laugh and joke around - not be serious and miserable as they grow. I think it's a wonderful thing to hope for! hey girl! i just found your blog and i love it, i am going to continue to follow it. our stories are similar, check out my new blog i just made! i think our youth can teach us so much about how we should live our life -- i look at pictures of myself as a child .. downing ice cream cowns and birthday cake without a thought in the world... we can learn a lot from the youngsters!! I have soooo much respect for you. You're AMAZING!! !